The mass arrest of 918 people at the December 12 demonstration was a provocation to show the world that Denmark have the capacity to do whatever it likes to world citizens at a UN Summit. The selective arrest of CJA spokesperson Tadzio Müller on the eve of the Reclaim power action shows the extreme incompetence of the Danish police. I have personally listened to Müllers speeches at meetings and red his emails. There is no question about it. There is no grounds for the accusations made to prepare for violence against the police. On the contrary Müller have consistently underlined the strict non-violent code of conduct of the CJA Reclaim power action. Furthermore he has pointed at the successful mass non-violence direct action during the G8 summit in Heiligendamm 2007 and G13 action in the equally non-violent and finally successful struggle for a new Youth House in Copenhagen. Thus is the arrest of Müller a fake theatre by a desperate police that do not know what they are doing. There will be no sentences made in a trial as the police only used false accusations to maximize their military strategy to destroy the possibility to have good communication to see to that the non-violent code of conduct can be maintained as effective as possible. By provoking the participants by arrests ending in fake trials the police aims at polarisation in hope of being able to create violence and thus split the mass action and having excuse for attacking it. At the same time the police aims at presenting a media image in advance of a violent action so that as many as possible should stay out of it. The problem with this kind of military strategy by the police is that it both miscalculates the severeness of the climate crisis, the global demand for democratic rights at a UN Summit and as opponents they do not have a centralised military structure but dynamic and creative people from all over the world. On the one hand the military strategy of the Danish police can end in provoking a revolt among the impoverished and oppressed countries inside the negotiations thus destroying the image of Denmark as a broker in world politics. Military strategy is bad business when the survival of humanity and the planet is at stake. On the other hand the police have now shown its disinterest in maintaining order and instead is working to destroy the capacity of the Reclaim power action by fake accusations maximising the disproportionate use of law. Every police force interested in democracy and effective work knows that the purpose is to maintain both law and order. The Danish police have instead chosen to use the law to more than the maximum thus creating distrust and disorder. This becomes especially problematic if something external occurs. 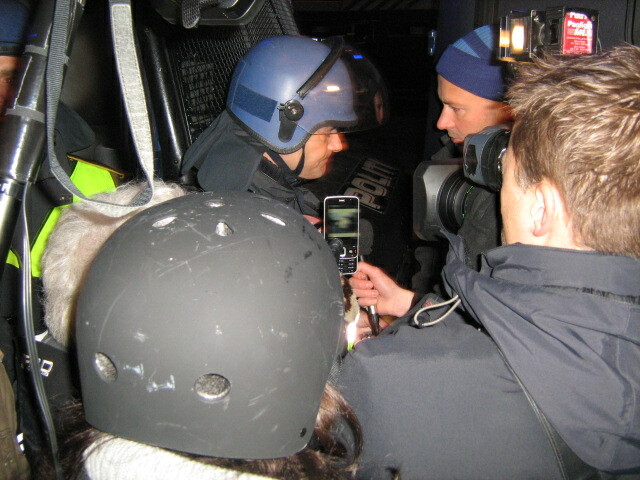 At the EU-Summit in Gothenburg 2001 the head of the police operation had chosen to use the laws to a maximum to such a level that the supreme court afterwards claimed that this had triggered riots. The whole alternative summit and a peaceful demonstration was stormed by the police violently in a military strategy causing a lot of problems and strongly criticized in a report by an official commission. The peak of the violence came at a Reclaim the Streets party when the provocative strategy of the police already had made the situation extremely tense. A criminal that disliked the police disturbed the communication system so the police operation was not possible to command properly anymore. The situation went out of hand ending in police on purpose shooting at people almost killing one demonstrator. A situation already triggered to the extreme by the police attempts at destroying the infra structure of the whole movement and its counter summit and convergence centre thus contributing to maximising disorder. The mass arrest during the December 12 demonstration and the arrest on fake grounds of Tadzio Müller have the same intention and the same possible result especially if something external occurs as in Gothenburg. Who is than to blame is clear, it is the Danish parliament that have given the police such extraordinary freedom not acceptable in any other democratic country or even some dictatorships, at least according to Western democratic standards, that the head of the police have lost his sense of proportion and acts irrational. What the head of the police Per Larsen do not understand but the rest of the world understands is that non-violent civil disobedience is an indivisible part of democracy and is utterly legitimate when the fate of humanity and our planet is at stake. His military strategy will fail in one way or another, the concerns of people in Africa, Asia, the Americas, Oceania and Europe will unite in a common force both from inside COP15 and outside in the struggle for climate justice. I wonder if there is “incompetence” as you say. I would rather guess that the violence is quite intentional, and perhaps not originating with the police but rather with the government. The intent should in that case be to create disorder in order to pose as the strongman who is able to quell discontent, and get goodwill from that. In Italy it was called the Strategy of tension. A fascistoid agenda all right, but isn’t that what you can expect from this Danish government? SAD FOR TH EDANISH PEOPLE AND MORE SAD FOR THIS INCOMPENTENT GOVEREMENT! ABSOUTLY. BUT THEY HAVNT LEARNED ANY LESSONS YET AND THAT IS NOT MY PROBLEM !